Further expanding their line-up of cold beverages, Starbucks unveils specially handcrafted soda flavours in select stores in Imperial Manila (kidding), I meant in the Metro. 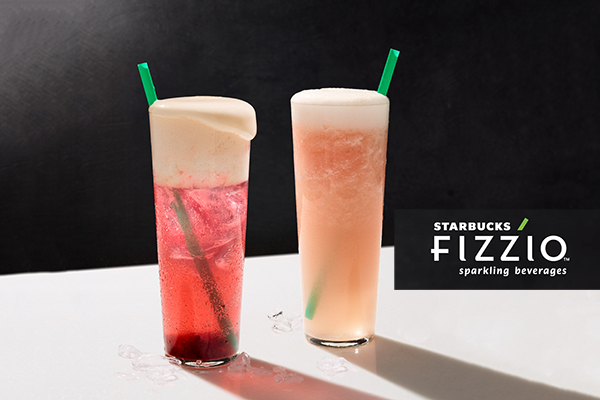 Starting June 7, you may cool off with Coconut Water with Watermelon Granita Starbucks Fizzio or the Red Cranberry with Grapefruit Foam Starbucks Fizzio. Coconut water and lime infused with tiny sparkling bubbles then poured over a watermelon granita for that exciting kick of refreshment. Watermelon puree is blended with ice, while lime and coconut water join the cane sugar base to provide a refreshing beverage. Enjoy tiny sparkling wine-like bubbles infused with flavors of red cranberry and grapefruit foam, handcrafted for your personalized taste. This beverage is full of romance and intrigue from the velvety foam topping, a dash of ancient Chinese orange bitters up to the cranberry sauce texture on the bottom. From 10AM to 2AM on June 13 to 21, customers who purchase of any featured Fizzio Sparkling beverage will receive P50 off every on any lunch sandwich which includes Four Cheese and Garlic, Chicken Pesto and Shiitake Mushroom Melt on Flat Bread, Meatloaf on Cheese Focaccia Bread, Tuna Salad on Pumpernickel Bread, Chicken BBQ on Corn Bread and Tomato, Mozzarella and Basil on Flat Bread. Starbucks Fizzio Sparkling beverages are available only in the following Starbucks stores: Capitol Commons Pasig City, Trinoma Level 2 Quezon City, Matalino Street Quezon City and Festival Mall Alabang.